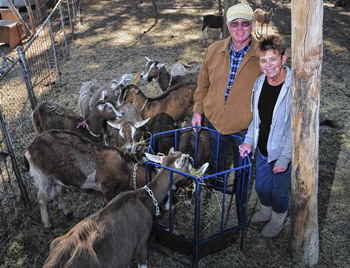 We started raising goats in 2009 after purchasing three Toggenburg doelings at the Yuma County Fair. That was the start of our obsession with the "Toggs!" We have traveled throughout the western US to collect additional top producers for our herd, which is in excess of 40. The Eatons have attended the American Dairy Goat National Convention on numerous occasions and exchanges ideas with other goat owners nation wide. People ask why we do this - because we love the goats. And they go "Baaaa."